The first session of the new Horsham Repair Café on Saturday 7th October proved an outstanding success. At 10am approximately 50 people came through the doors of the Horsham Quaker Meeting House to witness the official opening by Jeremy Quin MP and Councilor Philip Circus, who spoke about the importance of this initiative for Horsham District. Carrie Cort and Jill Shuker from Sussex Green Living are both WSCC trained voluntary Waste Prevention Advisors and they have partnered with the Horsham Quakers to set up the Horsham Repair Café. Jill said “The first Repair Café is focusing on repairing and reusing textiles. We know that West Sussex County Council spends £1.4 million every year on disposal of textiles thrown away at home in the general waste bin, so this project will help to reduce that cost to the Council and tax payers”. Carrie continued “The concept of a Repair Café means that members of the public don’t just drop their items and go off shopping, they sit with the voluntary repairer and learn how to do the repair or adaption themselves”. At this first Repair Café there were five Sussex Green Living creative sewing volunteers who repaired 15 pieces of clothing and bags, as well as inspiring people with creative textile crafts. There was a colourful display of clothes and bags which had been made out of ‘unwanted’ materials. The launch of the first Repair Café in West Sussex is thanks to some start up funding from Green People’s ‘20 Ways to Change the World’ grant, given out to mark their 20 years of creating natural plant based organic beauty products with human and environmental health in mind. The founder of Green People, Charlotte Vøhtz, joined the Repair Café to see how the local community are benefiting from the £1000 grant. The organisers were delighted with the level of interest shown by the local community in the Repair Cafe and they managed to recruit three more volunteers who want to help this community driven initiative! Donations of materials, cotton thread and felt were received, with promises of extra donations next month. There was even a visitor from Transition Town Worthing who came to see the Repair Café in action, as Worthing are now considering setting up their own one. 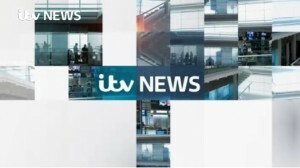 ITV Meridian filmed the launch and helped to spread the word about this great new community led initiative. The next Horsham Repair Cafe is on Saturday 4th November when the Kinder Tech team will be helping to repair and improve the performance of laptops and PCs. The session will run between 10am and 12.30pm and booking a repair slot is essential. There will also be one sewing machine and a couple of volunteers available to help with clothing repairs. Anyone interested in bringing a laptop, PC or clothing to be repaired or sharing their practice skills in a voluntary capacity should visit http://www.horshamrepaircafe.org.uk/contact-booking/. Sussex Green Living (SGL) was launched in 2012 by a Billingshurst mother Carrie Cort, out of concern for environmental stability. SGL and its growing team of passionate volunteers inspire, motivate and equip people with practical and creative solutions to lead a more sustainable and adaptable way of living. They want a world where everyone lives within their environmental limits, sustainable communities which are vibrant, healthy and safe, respecting the local and global environment and where individuals and enterprise prosper. Carrie provides environmental education and awareness through: fun green play sessions, and talks and workshops for children’s nurseries, schools and groups. She communicates greener living ideas through the Sussex Green Living ‘recycled stand’ at shows and supports event organisers with building in ‘green’ elements to their event. Working in partnership with the Horsham Quakers, Carrie, Jill Shuker and a group of local volunteers have set up the Horsham Repair Cafe. 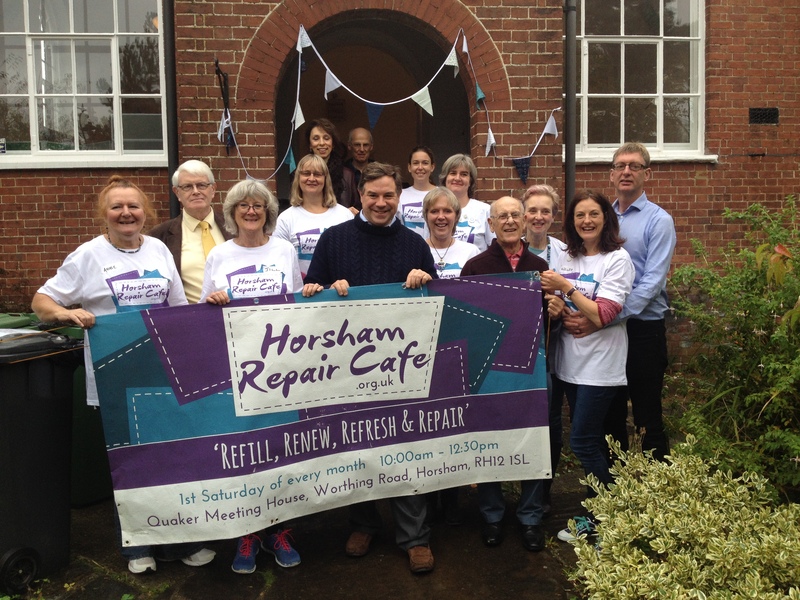 Launched on 7th October, it will take place on the first Saturday of every month 10am – 12.30pm at the Quaker Meeting House, Worthing Road, Horsham, RH12 1SL, to learn more visit www.HorshamRepairCafe.org.uk. Shortlisted – WWF Earth Hour – Community Hero Award 2017 at the same awards ceremony in the Palace of Westminster, Her 9 year old son won the WWF Climate Challenge KS2 poster competition. In March 2016 Carrie travelled to Manila, Philippines to train with former Vice President Al Gore, Leading Climate Change scientists and communicators in the Climate Reality Leadership. She is now one of 11,000 activists in a global network committed to spreading awareness of the climate crisis and working for solutions to the greatest challenge of our time. 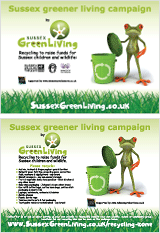 For further information on the work of Sussex Green Living please see www.sussexgreenliving.co.uk. The Repair Café concept originated in the Netherlands in 2009, and was formulated by Martine Postma, at the time an Amsterdam-based journalist/publicist. In 2010, she started the Repair Café Foundation (see www.repaircafe.org). This foundation provides support to local groups around the world wishing to start their own Repair Café. The foundation also supports the Horsham Repair Café.